The ARTS represent an outlet of human expression through dance, music, song and creativity that is heavily influenced by culture in our society which in turn helps to change culture and bring people together. By continuing with the Great Artists Series’ illustrious and world-renowned 50 years of presenting international world-class established artists, our mission is to continue presenting South Florida performances and events featuring and/or promoting undiscovered young talented musicians and dancers, as well as, international world-class established artists. Arts and culture are a crucial component in the long-term viability of communities and play a significant role in local economic development. The Great Artists Series hopes you will help us build on our South Florida rich international arts and cultural heritage. In turn, the Great Artists Series will connect arts and community and help to ensure a vibrant future for many generations. To support the Great Artists Series and on ways to become a corporate sponsor, please contact Angela Shlyakhov, Executive Vice President of the Great Artists Series, at 305-374-0501 or angela@markbryn.com. 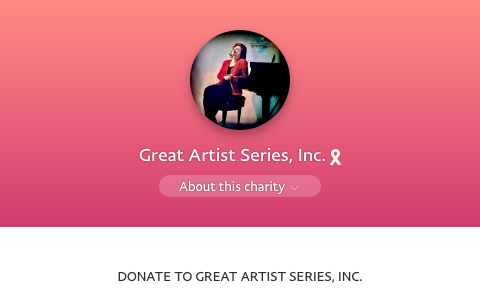 Donating to the Great Artists Series, Inc. The Great Artists Series, Inc. is a 501(c)(3) non-profit organization; contributions are tax deductible to the extent permitted by law. Information concerning the Great Artists Series, Inc., including financial, licensing or charitable purposes, may be obtained free of charge by writing to our principal offices at: Great Artists Series, One Biscayne Tower, 2 South Biscayne Boulevard, Suite 2600, Miami, FL 33131, or by calling +1-305-374-0501. A COPY OF THE OFFICIAL REGISTRATION AND FINANCIAL INFORMATION MAY BE OBTAINED FROM THE FLORIDA DIVISION OF CONSUMER SERVICES BY CALLING TOLL FREE 1.800.HELP.FLA (1.800.435.7352) WITHIN THE STATE OF FLORIDA. THE DEPARTMENT’S WEBSITE IS www.800helpfla.com. [s. 496.412(1)(c), F.S.]. REGISTRATION WITH A STATE DOES NOT IMPLY ENDORSEMENT, APPROVAL, OR RECOMMENDATION BY THE STATE.